Today is the last day of the 2015 Path Intl Conference, but by far not my last post. However, instead of posting notes from specific seminars, I’m going to group some of them by theme because I think that would be more helpful. So here are a bunch of notes and tips about teaching specific disabilities. Reflect on yourself, do they not like your tone of voice? Are you impatient, less tolerant? Often seen in Downs Syndrom, vestibular issues, balance issues, brain damage, no depth of field vision. We think the horse is close enough to the block, to them it looks like the Grand Canyon. Paint the surface of the block a little different color, to differentiate it from the ground below. Add grip/sand to the block so it feels more secure. Acknowledge the fear, it is real. Considering for the first few lessons it’s a new place, new animal, and new people, it’s understandable. Usually if you just force them on and go, within a few steps they’ll quiet. If not the first time, then usually within a few weeks. Ask their parents if they prefer you to push through it, or take a different approach. Create mounting protocol. “You need to be quiet because we need the horse to know you’re ready to get on.” They’re motivated to work with the horse. The person has to signal to the horse that they’re ready. Use their interest. If they like to draw, paint with the volunteer next to the stall, then paint by the horse, then painted on the horse. Use an activity to follow through. Set boundaries with clear expectations – even if it takes standing for 20 min because they won’t 2 point. Move behavioral modifications will occur if you’re very clear. Lots of pictures, matching cards, to get them to interact with volunteers. Remember they probably are doing more here than anywhere else or in their home, because they have a reason to talk. Can help their parents. “Peter, when you go home, I expect you to be nice to your parents.” The next week ask if he was nice and they say he was rude two times. So he only gets to ride 20 minutes this week. For those who jump off horse – if head dive, lock into thigh hold and bump his shoulder back up and he’s not coming down. If they throw themselves backward, push them back up without breaking them. Use a gait belt. They’ve gotten their way for so long by throwing fits. Just let them scream. For the others, have the volunteers help them. The screamer, park them in the middle of the arena and they can join the rest of the class. OR change the target. You’re moving around so much, until my horse knows he can keep you safe, he’s in time out. 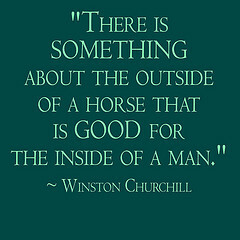 So it’s not about him but the horse. Present calm and soft. Horses have attachment styles too, though it’s not that well researched. They usually prefer food and safety to praise as reward. Some prefer men or women, certain clients, groundwork or riding. Parelli’s Horsenalities outlines one theory of how horses work with humans. Your past and childhood experiences may affect how you interact with what’s happening and how you relate to the client. 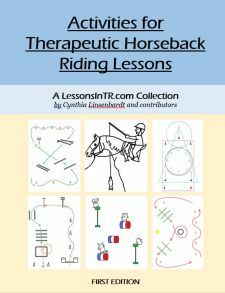 Riders with attachment disorders may dissociate a lot. They may use the horse as a tool because they’re afraid of the relationship, instead taking control to the extent of being abusive. They may transfer past experiences, seeing the TRI as some important figure from the past and react based on that past, not based on what is actually happening. Riders may take a long time to bond with the horse. But don’t assume that just because you don’t see it, it’s not happening. What they project may be very different from their internal reality. They won’t tell you they’re starting to relate, but you’ll see more receptiveness to the horse. Horses promote trust and seeking safety from somewhere or someone, because they are big scary animals. If the rider doesn’t want to relate to the horse, use mutuality – you do something for me, then I’ll do something for you. Management starts as soon as they arrive. They shouldn’t be playing in dirt etc. Talk to the parents (“they’ll faint, cry, or hug you”). Set clear expectations and stick to it. “I need you parents to help me get them into the property, get their helmets, and sit quietly on the bench.” (It took Jen D 6 months for her difficult client to learn to do all that, with constant redirection). Do your homework. Ask their parents what the child is interested in. Use their interest. Meet their needs. If they need to mount right away, do it. If they need to get there a half hour early and go through a whole transition routine, do that. Use lists and icons, the same every single week. Let them know ahead of time if changing the horse. For example one kid loves to go outside, so he has a list of 10 things he must do on the horse before he can go on a trail ride, such as go outside, such as halt, return his ball, etc. the same every week, and he can’t trail ride until he does it all. Volunteers know the list and help him. Eventually it clicks and they do it all by themselves. When you’ve noticed you’ve lost them, trot them off, then usually you’ll have enough attention after to ask them to pick up their reins, walk to the pole and halt. Then you might have to trot them off again. Learn basic sign language and/or invent your own. Create one for “no” to break fixation, one for “sit tall,” and “wait quietly.” Use eye contact. Make clear expectations. Ask are we turning left or right today. They choose in whatever way they can. If they don’t, say gosh, we’re not being safe today, should we go back [from the trail ride]? And they usually do it. Consider sensory input from their mount. Sometimes they are mismatched and the rider won’t participate with a movement they don’t like. Practice skills on the ground first. If they can’t sit still on the horse, learn to stand quietly on the ground. It may be a slower process, you just have to wait it out. Write out a social story to tell them about the plan for the day. Or use icons, pictures on flash cards, halt/basketball. May need to use same warm-ups or lesson plan every week. For example, red/green light, with icon cards, for warmup every single week. You’re welcome, I’m so glad you find it useful!